"Thank you for the awesome work your team did on the App. It has been a pleasure working with CloudFronts - on time, on budget, excellent ideas and support, putting in the extra effort, and the result is amazing. The team did an amazing job of fully integrating the previously stand-alone Excel version to new integrated D365 version which helps sales professional sell and actually WANT to use the CRM system!" Microsoft Dynamics 365 offers organizations across various verticals and of different sizes to successfully deploy their business processes from Sales to Delivery. Microsoft Dynamics 365 Partners can showcase their expertise by developing solutions for a specific business need or an industry vertical and listing these on the AppSource. Our App development services team has deep expertise developing sophiscated business apps on top of Dynamics 365 for our partners. We help you through the entire lifecycle, from Development to AppSource listing and enhancement support, allowing you to focus on your Business Strategy and Marketing. Design Our qualified team of D365 Architects and Developers will work closely with you for understanding your requirements and designing the right solution based on use case scenarios. Development Our team will undertake the complete development efforts and all work will be done with regular co-ordination with our partner. Our teams use standard Microsoft development technologies like Visual Studio and TFS Online for a robust development process. AppSource Listing Once the app is ready and internally tested, we will work with you to submit the app to Microsoft, address any issues and get the app listed on the AppSource. Our expertise on having listed multiple apps on the AppSource, allows us to address most of the requirements during the first submission process, thus reducing time to market. We will integrate lead generation from AppSource to your Dynamics 365 Sales platform, thus feeding your pipeline. Continued Enhancements Once the App is live on the AppSource, we will continue to work with you through a Managed Services offering for ongoing support, feature enhancement and version upgrades of your Business App. Check SOS for Dynamics 365 developed by CloudFronts, available on AppSource. 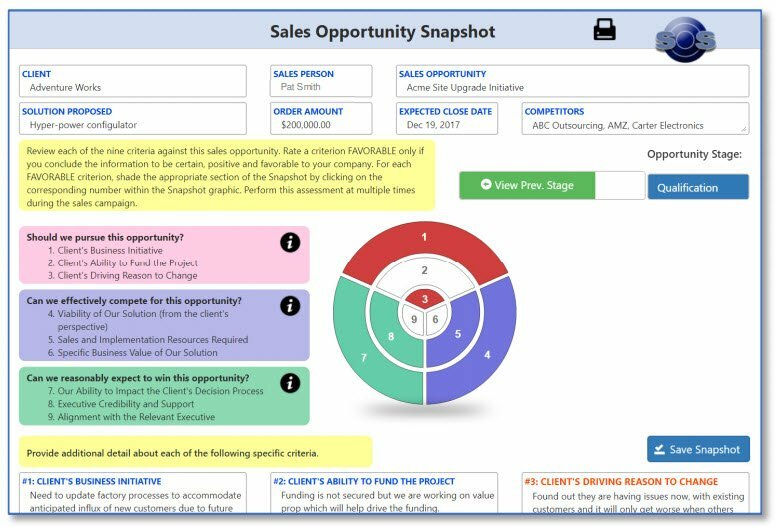 Sales Opportunity Snapshot (SOS) is a proven Sales Methodology, which is now available as a D365 Managed Solution on the AppSource. SOS focuses on helping professional salespeople analyze and manage their sales opportunities quickly and more effectively, increasing win-rate, margin, and customer satisfaction. Select a sales strategy for the opportunity, including an assessment of the strengths and weaknesses of major alternatives. SOS for D365 is available to extended members of the sales team and can also be used by sales management to validate forecast probabilities and allocate resources. It can also be used to prepare and update sales executives who might be asked to call on various executives in the client organization. Please fill your details to schedule a demo. Please fill your details to download the booklet.